Puerto Rico decriminalizes, polls in Texas and Canada show strong majorities for marijuana law reform, Ohio and Michigan are moving on asset forfeiture reform, DEA agents flunk drug tests with few consequences, and more. The Dutch Supreme Court says foreigners can be banned from cannabis cafes, but the cafes don't seem to be paying attention. Puerto Rico Decriminalizes Possession of Up to Six Grams . Gov. Alejandro Padilla Garcia Monday signed an executive order decriminalizing the possession of up to six grams of marijuana. Instead of criminal proceedings, people caught with small amounts of pot will be subject to a fine, or possibly drug treatment. The governor cited the high cost of prosecuting small-time offenders. Texas Poll Has Three-Quarter Support for Marijuana Reform . Nearly three out of four Texans are ready to liberalize the state's marijuana laws, according to a new Texas Lyceum Poll. The poll had support for legalization at 46%, with another 28.5% supporting decriminalization. That's 74.5% for liberalization. Only 19.5% opposed both legalization and decriminalization. Clink on the link for more poll details and methodology. Michigan Attorney General Backs Asset Forfeiture Reforms . Attorney General Bill Schuette (R) is supporting a package of civil asset forfeiture reform bills. The bills, which have already passed the House, wouldn't entirely eliminate civil asset forfeiture, but would increase the burden of proof on law enforcement to keep seized property and would require more transparency. "On this issue of forfeiture and transparency, as a lawyer and as attorney general, I'm in support of these seven bills," Schuette said Tuesday during a press call organized by Fix Forfeiture , a national and bipartisan group advocating for reform. "This is a good effort. A good team effort." Ohio GOP Legislators File Bill to End Civil Asset Forfeiture . Nineteen House Republicans cosponsored a bill Tuesday that would eliminate civil forfeiture under state law and only allow criminal forfeiture after a defendant is convicted of a crime. The lead sponsor is Rep. Robert McColley (R-Napoleon). The bill is not yet on the legislative website. DEA Agents Fail Drug Tests, But Face No Serious Consequences . At least 16 DEA employees have failed drug tests, but only got short suspensions or other minor punishments, according to newly released documents . None was punished with being fired, and most were suspended for a day or two. Click on the title link for much, much more. Canada Poll Has Strong Majority Supporting Marijuana Reform . A new Vote Compass poll has support for marijuana legalization at 56%, with another 30% saying they supported decriminalization. That's 86% in favor of liberalizing the country's marijuana laws. Only 14% said possession should remain a criminal offense, the position of the Conservatives in next month's elections. The Liberals are calling for legalization, while the New Democrats are calling for decrim. Click on the link for more polling details, methodology, and discussion. 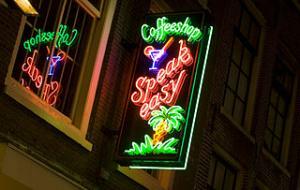 Dutch Supreme Court Upholds Ban on Tourists in Cannabis Cafes . The Supreme Court ruled Tuesday that the country can ban foreign nationals from cannabis cafes because such a move does not conflict with European anti-discrimination legislation. The Supreme Court cited a 2010 European Court of Justice ruling that said restricting sales to foreigners is "justified by the objective of combating drug tourism." But the ban appears to operate mainly in the breach. A 2013 survey showed two-thirds of cannabis cafes were selling to foreigners.